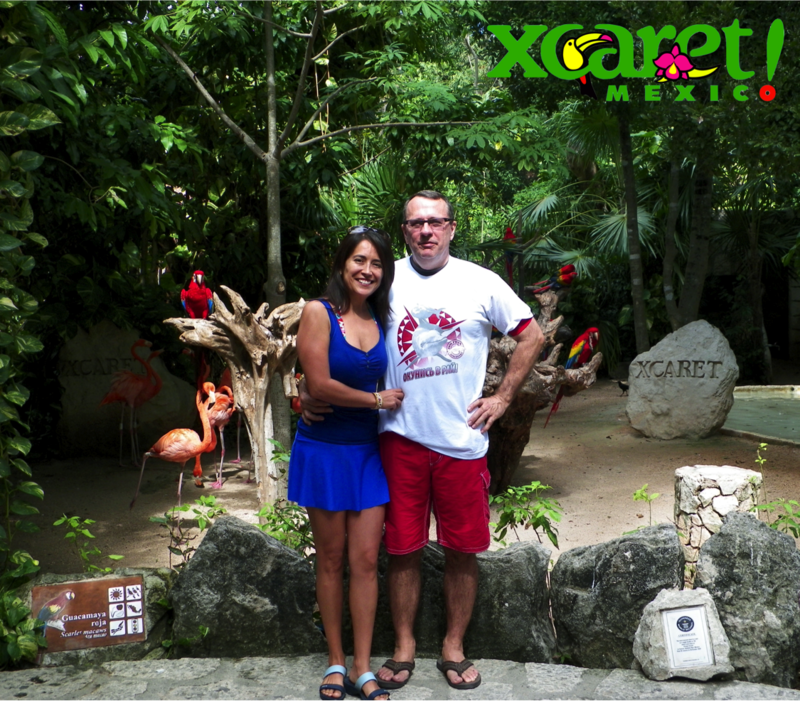 Next stop is Xcaret, a beautiful place in the Riviera Maya! Xcaret is a popular archaeological park, located only 15 minutes from Playa del Carmen. I can’t believe I haven’t visited this place in my time working at Condo Hotels Playa deal Carmen. It’s unforgivable! My visit was an incredible experience. I know you hear that a lot but believe me, it’s true. It’s a fantastic place to spend a day, and I mean a full day. The place is so big that even one day might not be enough. The whole park is amazing. If you’ve been there I know you’ll agree. We started our visit, (we being the ever-popular Lorena, Fred, a good friend and his girlfriend) with the beautiful church, “Capilla de San Francisco de Asís.” The place is perfect for a beautiful wedding. Amazing flora and fauna could be found all around us, accompanied by many interesting archeological ruins. We saw butterflies, jaguars, monkeys, salamanders, snakes, iguanas, and parrots just resting and enjoying the sunny day. There are so many things to be captured that you’d better bring your camera to preserve these memories forever. If you like up close and personal interations with aquatic creatures then this is the place for you. The Coral Reef Aquarium is incredible! Here you’ll find stingrays, lovely turtles, anemones, sponges, star fish and crustaceans, manatee, and all other kinds of sea life. Next we went to the bat cave. Actually, only Fred and me went. The girls preferred to enjoy the sun outside. They rejoined us later at the river. It was so peaceful hearing nothing but the sounds of the nature. We also visited Mayan Town, which had traditional mexican cemetery. It was built into a cone shape and had seven levels, representing the days of the week. There were even 365 graves there, one for each day of the year. It was incredibly fascinating. At the end of the day (and after mucho tequila), we enjoyed an amazing mexican show in Hacienda Henequera. I still don’t know how some of the performers pulled off some of those stunts! There’s really only one word to describe that night: WOW! Here are a few tips if you decide to visit yourself. First of all you, need a full day (maybe two) to enjoy this amazing place. Be sure to bring along a camera, preferably waterproof, and biodegradable sunscreen. So after my first time in this beautiful place, I can say without any doubt that I’ll be back soon. This is an excellent park that is dedicated to maintaining the delicate eco-system of the area and promoting preservation. Families with children, couples, seniors – anyone, really – would enjoy this place and could pick and choose what to see, what to do, and at what pace. You can view the rest of our gallery of images here. If you’ve been there while staying at Condo Hotels Playa del Carmen, feel free to tell us your favorite parts!